The last time the Vancouver Canucks pumped in eight goals in one National Hockey League game, their scorers included Steve Bernier, Mathieu Schneider and Tanner Glass. Henrik Sedin had a hat trick and Ryan Johnson had three assists. So it had been a while. The Canucks beat the Boston Bruins 8-5 on Thursday, reaching that offensive high-water mark for the first time since a blowout in Denver on Nov. 14, 2009. And their unlikely scorers included Loui Eriksson, Erik Gudbranson, Ben Hutton and Antoine Roussel. Even more surprisingly, super-rookie Elias Pettersson registered only a single second assist among the eight goals after entering the game as just the fourth player in nearly a century to score 10 goals in his first 10 NHL games. But that’s the Canucks for you – continually surprising with their ability to score and win. Last season’s 73-point team is now 10-6-1 and 4-0-1 in its last five games. During this points streak, they have won games in which they’ve allowed at least five goals, twice. They outshot the excellent Bruins 33-28 and trailed only once – for 6 ½ minutes – early in the second period. The Canuck power play scored twice, matching the Bruins’ lethal man-advantage unit, and Vancouver goalie Jacob Markstrom was still better than either Jaroslav Halak or Tuukka Rask. And Boston’s formidable first line of Patrice Bergeron, David Pastrnak and Brad Marchand combined for just one goal, two points and a minus-eight rating. The Canucks play the middle third of their six-game road trip Saturday in Buffalo, before playing back-to-back games against the Rangers and Islanders starting Monday in Manhattan. Before Elias Pettersson, before Brock Boeser, there was Bo Horvat. Almost lost in the vortex of Pettersson’s astounding career start is that Horvat, the fifth-year pro and future team captain, has elevated his game yet again and is having a terrific first quarter. It was hard not to notice the fleet, powerful Horvat on Thursday. With Boeser home in Vancouver injured and Pettersson quiet and on another line at even strength, Horvat had two goals and two assists, four shots on net, led Canuck forwards with 19:03 of ice time and took 30 faceoffs, winning 16 of them. He also took three penalties, which reduced his shorthanded TOI to just 35 seconds and made him a double threat instead of a triple threat. After the last of his minors – and with the Bruins down 6-4 and pressing halfway through the third period – Horvat emerged from the penalty box in time to chase a lob pass from Markus Granlund, then knocked down Bruin goalie Rask’s clearance and spun and fired into an unguarded net to guarantee the win. It was the play of the game. And Horvat was the player of the game. Is it too soon to ask seriously if the Canucks are for real or just a young, rebuilding team riding enthusiasm and beating unprepared opponents? Based on last season, yes, it’s too soon. Remember, the Canucks started last year 14-10-4. Then Horvat broke his leg, injuries reached a critical mass and the team went 2-11-2 over the next five weeks to plummet towards the bottom of the standings. But this year does seem different. It feels different. Sure, a rookie like Pettersson helps. But it’s a lot more than that. The Canucks have an identity they didn’t have a year ago, they’re scoring by committee and are buoyed by a handful of young pros who are still getting better: Pettersson, Horvat, Boeser, Virtanen, Nikolay Goldobin, Derrick Pouliot and Ben Hutton. They’re also beating championship-calibre teams despite a pile of key injuries beyond just Boeser: top defenceman Alex Edler, playmaking winger Sven Baertschi, key centre Brandon Sutter and veteran leader and penalty-killer Jay Beagle. We’re not predicting the Canucks will maintain their .618 winning pace and finish the season with 101 points. We’re not saying they’ll still be in a playoff spot after the all-star break. But with their work ethic and the trajectory of their young talent, plus injured players returning in the next month, the Canucks probably aren’t going to collapse again. They’re going to be a tough out for opponents all season. Jacob Markstrom has started six straight games since backup Anders Nilsson suffered a broken finger, and it looks like the Canucks’ No. 1 netminder needs a rest or a reset or both. Markstrom has shown numerous times that he benefits from a playing break, which gives him extra practice time with his goaltender coach and the chance to clean up his game. The most recent example was just 2 ½ weeks ago when, after watching Nilsson get four consecutive starts, Markstrom returned to the net and looked far more efficient and composed as he won two games while stopping 63 of 66 shots. In the two games before that reset, Markstrom allowed 10 goals on 68 shots. With the Canucks’ well-spaced, albeit road-heavy, schedule and Nilsson’s absence complicated by the unavailability due to injury of top minor-league goalie Thatcher Demko, it’s understandable that Vancouver coach Travis Green would ride Markstrom as long as possible. But, he allowed five goals on 28 shots in Boston and now has a save percentage of just .882 in the six games since Nilsson was hurt. Veteran callup Richard Bachman isn’t anyone’s idea of an NHL starter. But he is a diligent, competent pro with a lot of experience and certainly can handle a game or two at this level while Markstrom works with goaltending coach Ian Clark. Bachman made five appearance for the Canucks last season, winning two of them and stopping 92 per cent of shots. It’s time for Bachman to get a game and Markstrom to get some quality practice time. The return to Vancouver earlier Thursday of Brock Boeser for further testing means the Canucks are without their top winger indefinitely. Chances are doctors will confirm the existing diagnosis of a groin injury, which took Boeser out of the lineup Tuesday in Detroit for the second time in two weeks, and the 21-year-old will be listed as day-to-day and have a chance to rejoin the team before their six-game road trip ends. But Boeser was sent home for tests because the team is uncertain about his injury, which worsened in last Friday’s win against Colorado — four games after the Calder Trophy runnerup returned to the lineup. As general manager Jim Benning told Sportsnet, the Canucks "want to make 100 per cent sure we’re dealing with the right thing." Either way, this is a significant concern given Boeser’s critical importance to the team and the wrist and back injuries that required treatment last spring and prevented the Minnesotan from training fully until July. 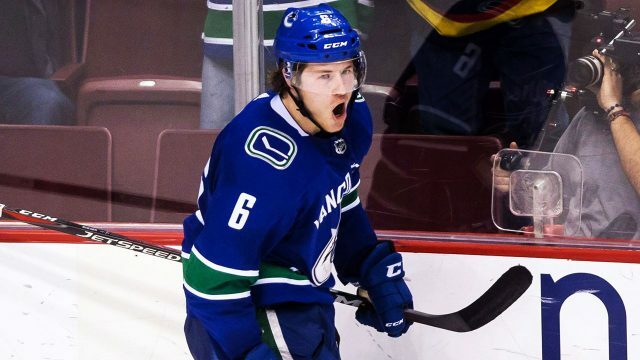 Whether it takes two games, two weeks or two months, the Canucks need Boeser healthy.